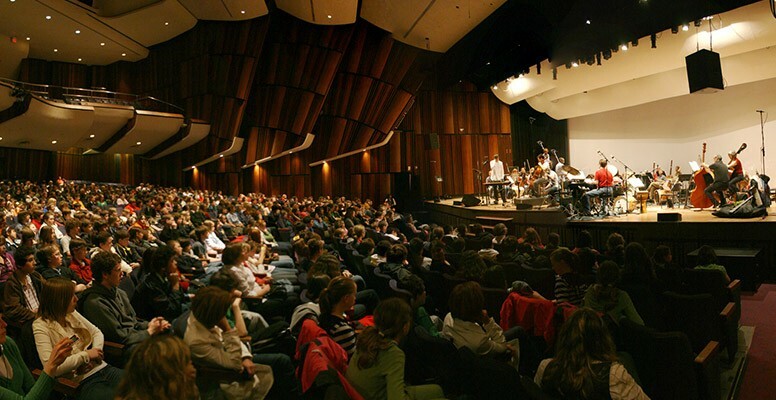 Symphony Nova Scotia’s School Open Rehearsals are a chance for children in grades four and up to experience the symphony onstage in the concert hall at a very reduced price. An emcee or the guest artist will guide your students’ experience and provide information about the rehearsal process. Please note that all of these events are working rehearsals, and are not intended to replace a live concert experience. This is an opportunity to watch and listen to the symphony in action as the musicians get ready for a concert. Your students will attend a dress rehearsal so the music will be getting the final polishing for public audiences but the players won’t be formally dressed. All School Open Rehearsals take place at the Dalhousie Arts Centre, 6101 University Avenue, Halifax. Start time is always 10:00 am on the morning of the day of the regular concert. Symphony Nova Scotia is developing Teacher Guides for these performances, which will be available soon. Cost: $7 per student. For every 10 student tickets purchased, one chaperone ticket will be free. Tickets: contact D’Arcy Gray at darcygray@symphonyns.ca or 902.403.7197.